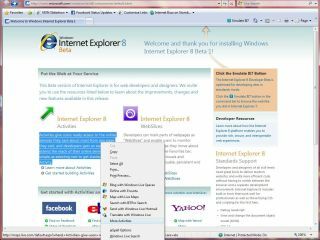 Update: read our Hands on: IE9 review. At the Microsoft Professional Developers Conference in Los Angeles, Windows President Steven Sinofsky claimed that Internet Explorer 9 will enjoy a serious performance boost, but held back from promising any launch date. According to Microsoft figures, an early build of IE9 already scores four times as highly on the Acid3 benchmark for Web 2.0 applications. Internet Explorer 9 will rely heavily on PC hardware to deliver performance gains, said Sinofsky, thanks to a new rendering engine will move processing to the machine's graphics chip. It will be the first browser to use hardware acceleration to render all kinds of images, videos and text. Other tweaks will include rounded edges on text boxes and support of HTML 5. With Sinofsky refusing to even hint at a release date, few expect IE 9 to appear significantly earlier than Microsoft's usual two-year browser roll-out - which would see a full release in early 2011.